[ Qoreader Blog ]: [Article] Keripik Iblis a.k.a Demon Chips ; Its Spicy but Tasty. Once you try it, you cant never stop to finish it.The Keripik itself has several level for each product, 1 to 10, most of costumer like eating for 3-5 level only, that's enough if they don't want get severe colic. 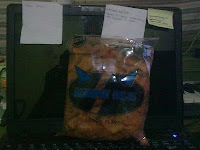 Keripik Iblis is made from Bandung, East Java. and the original maker import their products into several region exclusively, so no wonder its very expensive to get. Per-PCs you must spend almost 2$, but the satisfaction to eat endless spicy chips could be worthy if you want to make this as "sweet" laxative.